Wherever vehicles are present the risk of accidents and injuries occurring is increased. It is of paramount importance therefore that everyone knows exactly what to do when in or around a vehicle. This is where our range of car and vehicle labels can be especially useful. It would be impractical, not to mention difficult, to use a rigid sign in a car to advise passengers of safety instructions such as wearing a seat belt, however a label is perfect for the task. Our car and vehicle labels guide includes information on the different messages that are featured as well as details on relevant legislation. 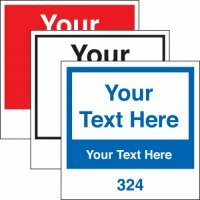 As well as being appropriate inside vehicles; car and vehicle labels are suitable for use in outdoor areas such as car parks and in certain spaces within the workplace, including entrances and exits. The labels can be utilised along with our traffic and car park signs to ensure your workplace complies with current health and safety legislation. Our car and vehicle labels address many problems that can occur if cars and other vehicles park illegally, or in places where there is designated parking only. The no parking labels we sell are ideal for use in a private on-site car park and in front of premises that have no parking areas. They are an effective way to stop people parking illegally in areas you need kept free of obstruction. Our range of parking permits can also assist with this. We provide a range of ‘you must wear your seat belt’ labels, including a nite-glo photoluminescent version that will glow for six hours once fully charged from a good light source. These labels ensure visitors and employees wear their seat belt when driving, so they comply with the law. Our ‘remove keys from ignition’ labels can be displayed at all entrances to ensure employees, visitors or customers remember to remove the keys from their unattended vehicle. We also stock a ‘beware forklift trucks’ label, which can be utilised in your workplace near the entrances and exits of forklift-use areas to ensure that staff, customers, and visitors are aware that forklifts are in operation. The ADR treaty governs the movement of dangerous goods internationally. Our ADR labels must go on all packages containing certain quantities of dangerous goods. They are essential if you will be transporting any of the substances that are covered by the treaty, such as flammable liquids or compressed gasses. These labels also feature an area to add a primary class or division of goods, and the name of the shipper or consignee if required. All the symbols on our labels conform to ISO 7010 when required, as well as meeting all relevant health and safety regulations, including those governing ADR and dangerous goods. All of our label’s symbols are known universally and designed to inform of hazards, provide instruction or communicate information. Finally, if you can’t find the label you require within our selection, then you can design your own customised car and vehicle labels via our website.